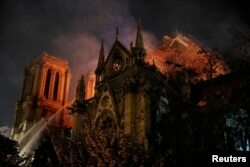 People pray and sing religious songs next to Notre Dame Cathedral after a fire broke out, in Paris, April 15, 2019. 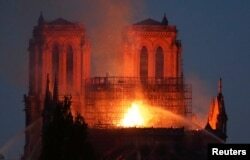 Distraught Parisians and stunned tourists gazed in disbelief on Monday as a monstrous inferno tore through Paris' Notre Dame cathedral, one of the world's best-loved monuments. Notre Dame survived being ransacked by rioting Huguenots in the 16th century, pillaging during the French Revolution of the 1790s and being left in a state of semi-neglect until Victor Hugo's 1831 novel "The Hunchback of Notre Dame," which led to renewed interest in the cathedral and a major restoration which began in 1844. Sparks fill the air as Paris Fire brigade members spray water to extinguish flames as the Notre Dame Cathedral burns in Paris, April 15, 2019. Former U.S. presidential candidate Hillary Clinton wrote: "My heart goes out to Paris. Notre Dame is a symbol of our ability as human beings to unite for a higher purpose — to build breathtaking spaces for worship that no one person could have built on their own."